miles due west of our home port at Happy Bayou. 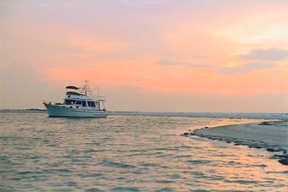 Happy Bayou, our Home Port, is a mangrove rimmed "hurricane hole" and marine nursery. To celebrate this setting, we have always named our boats "Mangrove Momma." In addition to time spent cruising up and down the coast of Florida and The Keys, on board our floating studio, Mangrove Momma IV, we lived and worked on board two weeks of every month. The week of the full moon and the week of the new moon found us anchored off our barrier islands of Caladesi, Honeymoon, Three Rooker Bar and Anclote Key. A boat has always been a critical tool to allow Hal to mix with the elements -- he likes to experience a location at different tides, time of day and weather. We spend long and concentrated periods of time observing shorebirds and other wildlife, storms, waterspouts, and incredible sunsets which envelop us 360 degrees. Countless images were inspired and/or created on board these vessels, including the hand pulled, hand colored original lithographs which make up "The Florida Wilderness Suite," the "Home Again! Suite," the "Anchorages I Suite," and the "Islands Suite," as well as etching/aquatints and innumerable one-of-a-kind watercolors and monotypes. Click Here to see art Hal created from this Adventure -- go to "Sun Sea Odyssey"
In addition to observation, field work requires "getting intimate with the environment" -- fishing, snorkeling and diving.